The 780 sq. ft. Comox Valley suite has a full kitchen, bathroom, bedroom, and living room with wifi, and smart TV. You can sleep four easily – two in the queen bed, one on the living room futon couch and one on the living room futon chair. We provide homemade muffins and granola, fresh eggs, fruit, and yogurt for breakfast on your first morning along with coffee, hot chocolate, and a selection of teas. Cream and sugar are always there too and the kitchen is fully stocked with pots, pans and basic condiments. We designed the suite to be wheelchair accessible but please talk to us about your specific needs prior to booking. Families and children are welcome. Children age 5 and under are accommodated for free. No smoking inside but we allow smoking outside. No pets please. 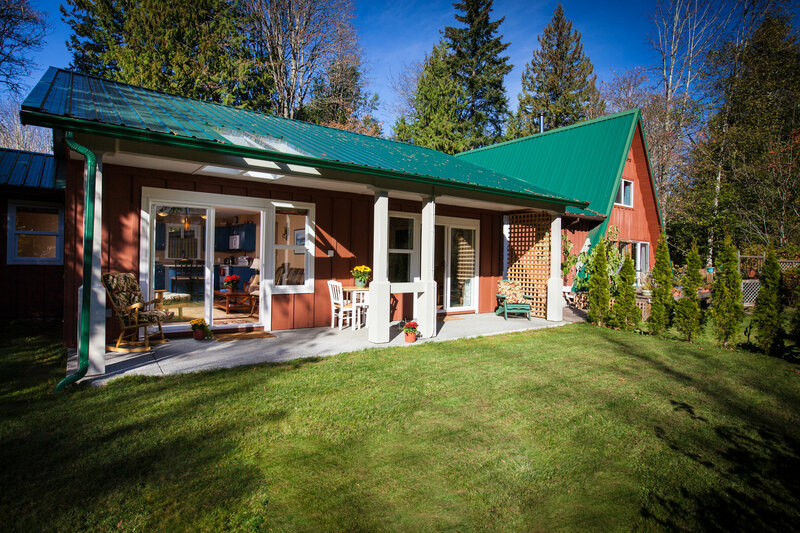 We are just 5 minutes from downtown Courtenay on the road to Comox Lake so we are just a short drive to weddings and other events at the Courtenay Fish and Game Club. A short trail connects our Copper Fern Guest House with our neighbour’s Applewood Cottage that sleeps six, so together we can accommodate 11 people.